I noticed on Tuesdays upload that these new Jet Crops have a different waist tie than the ones I already have. No little metal end caps on them which makes them look more casual. I just stopped in at the store and low and behold these are actually made of RULU, not the structured material of the Black and Textured Slate print from a few months ago. I didn’t get to try them on but I’m looking forward to it when they arrive this afternoon as they felt buttery soft in store. 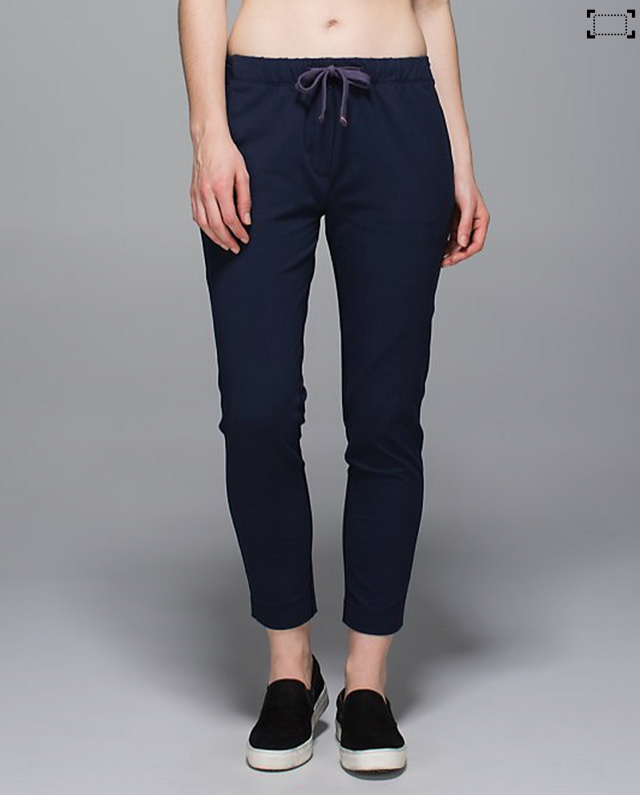 I’m surprised they are listed together though – the former trousers are much more work appropriate tailored looking pants while these look a bit more casual. Sort of in between Jet Crop Luon and Jet Crop Slims. If you are on the fence with ordering these, the RULU factor may push you one way or the other. "Brushed Animal Inspire Crops, Regal Violet In The Flow Tank, Fresco Swiftly LS, Pace Rival Skirts in Breezy Regal Plum and Brushed Animal"
"Fit Review: Jet Crop Slim Trousers *RULU"